We’ve received a review from one of our happy customers! This time, it is from Elius Levin from Australia, who has been working as a freelance business writer for the last 9 years and using Swift To-Do List for over a year now. Elius wrote this review because he is using Swift To-Do List and would like to share his thoughts with others. We have not compensated Elius in any way, nor modified his review. Recently, we’ve also published a review by Sherri Wilson, who runs a small labeling business, and by Chuck Gallozi, a successful writer and personal development expert. And now, over to you, Elius. I have been using Swift To-Do List (STDL) daily for 14 months—it has become and continues to be absolutely indispensable in my efforts to overcome the “chaos of the surging, heaving universe”. I am unable to answer the question “Does God play dice with the universe?” but at least operationally, here on earth, STDL is the tool that gives me the ability to be Master of My Own Universe—the feeling of competency that STDL engenders is simply priceless. I had previously utilised Zoho, the popular web-based, subscription project management software for 3 years. We both grew together, I in learning its effective use, along with its far faster development, major redesign(s), & its early-but-eventually-sorted-out problems with support, which then often could take up to 3 weeks to get an answer to a query. I had become a bit like the child who has a pair of shoes that is perhaps just a bit too large. There was no longer a good fit between me and the software. Armed with the knowledge gained from Zoho, my extensive research enabled me to whittle the shortlist to two, Swift and another popular task management software. Not yet into the world of mobile computing, I was seeking software which was definitely neither web-nor subscription-based, and had good support. And, as time has indicated to me, for the newbie product user the relationship with the developer is crucial, and can even be the deciding factor whether one purchases or continues use of the product or not. Questions of his responsiveness, willingness, degree of openness to suggestion or request, and the oft-neglected consideration of his degree of patience for initial newbie handholding, stumbles & mistakes while striving to learn—the “chemistry” – can not be underestimated. Both STDL and its developer Jiri Novotny have come through with flying colours on all points. As an independent operator, my requirements are that my task management tool be simple, easy-to-use, provide flexibility for increased or increasing complexity if & when needed—STDL has this in bucket loads. It allows those who wish to work with the creation of simple lists to fairly complex project management requiring collaboration & greater precision by use of task attributes and the filters. I work somewhere in between. One feature that I particularly liked about Zoho was its calendar design, while in some ways a little cumbersome, its smallness, flexibility, and its functionality I thought pretty good. To compensate for Swift’s absence of calendar, I utilised – incorrectly – the Find Tasks window to enable me to work across to-do lists and especially across tasks. Yet I had no way to minimise the window, enabling me to readily move to other software & return to the desired to-do list and task–I then made do with judicious use of the filters to assist me. The result of my long-awaited introduction of the Swift To-Do List calendar feature is joy—it too is small and unobtrusive . It also employs the core functions of the filters through the Find Tasks window–today, tomorrow, as well as essential column actions such as start date, due date, completion, creation, changes dates. Very importantly it can also be minimised, allowing ready movement to other software & return to the desired to-do list and task. This now makes task retrieval and my life much easier. I “reside” daily at the open calendar window, but should this now be not enough, I have found Find Tasks search to be a very good supplement. Another of Swift’s “small footprint” features that I like is the task-independent memo. While the calendar enables me to see across to-do lists and tasks, giving me the broad picture, the task-independent memo, only a single click away, enables me to “pull together” those tasks which are spread among numerous to-do lists but collectively are components of a project or theme. 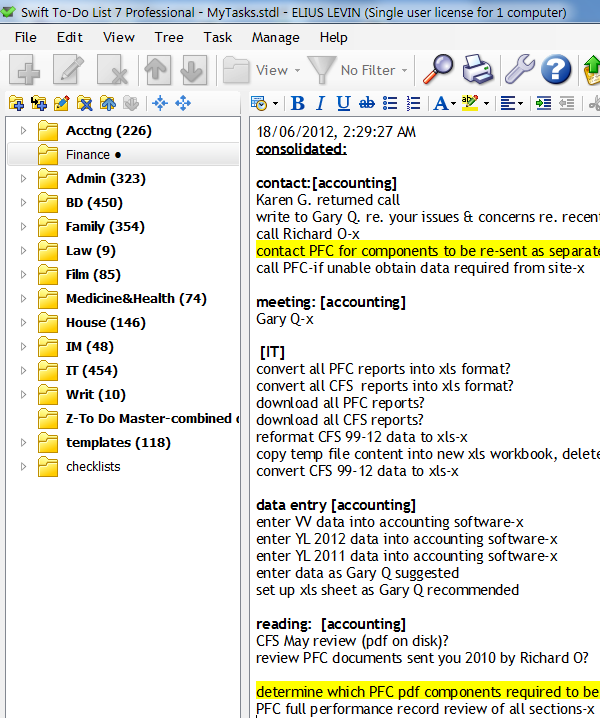 There is a lot of software within the task management ‘space’ or market, and I am sure even more since I selected STDL. There are many variables to consider carefully, as I did. I would very highly recommend that you give Swift To Do List a test run — I am sure that like me, you’ll find much that will satisfy.